Before you step into the house — even before you step into the yard — take a good look at the neighborhood. Be sure to note obvious things like the condition of the neighboring homes and the landscaping. Is the place close to shopping or other amenities? Nearby parks? What about nuisances like major traffic arteries or railroad tracks? When you buy a home you’re also buying into a neighborhood. Most sellers will spend some time and effort giving the yard curb appeal — pruning shrubs, planting fresh flowers and pulling weeds. Look a little closer for signs of care — or lack of it. Are the trees well-maintained and healthy looking, or will that oak tree limb near the driveway soon come crashing down? If there’s a fence, what kind of shape is it in? What about the hardscape like concrete walkways and patios? Defects here may affect your offer (or you’ll have to fix them yourself later), but they may also indicate maintenance habits throughout the rest of the home. While you’re outside, look over the building’s exterior. You aren’t conducting a full-fledged home inspection (that comes later), but you can observe the condition of the paint and siding, the eaves and gutters, and the foundation and roof. Many sellers will hire professional stagers to help show off the home in the best possible light — which may involve painting the walls, decluttering and positioning furniture to hide flaws and make rooms appear larger. Try to look past all that for obvious signs of structural weakness. Are the floors sagging or slanted? Do the walls have cracks, or if recently painted, signs of patching? How easily do doors and cupboards open and close? How well will your stuff fit? How well will you fit? An open house is not the time to break out the tape measure and the graph paper (save that for your follow-up private viewing). Still, during the open house try to get a feel for how the space will accommodate you, your family and all your stuff. Check the storage spaces in the kitchen, bedrooms and bathrooms — and the garage, too. Check the closets. Does the layout of rooms fit your lifestyle, or will you have to knock out a wall between the kitchen and the dining room to get the open feel you like? Your home inspector will take a very close look at the home’s appliances and major systems, but you can review them during the open house, too. Look over the furnace, the water heater and the air conditioning unit. Make note of the manufacturers’ names for later research, or use your smartphone to look them up right on the spot. If the manufacturer has gone out of business, you may have no choice but to replace it later if it fails. The same goes for the appliances. You never know what the future holds — a new job, a new addition to the family, a new hobby — and the new home that’s perfect for you now may not be right for you later. 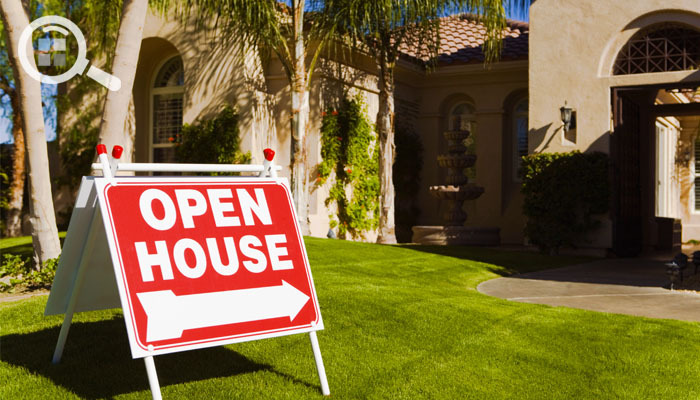 If that time comes, will you be able to sell the home easily and at a price that makes sense? Quirks like a tiny backyard or a bedroom accessible only via the butler’s pantry may be acceptable to you, but they may put off other buyers. As you’re thinking about moving into the house, you should also be thinking about moving out of it. One of the first things I notice when I arrive at a property is the condition of the landscaping and grounds. It’s the first sign that the sellers of the home truly cared about their investment. If a home looks poorly on the outside, then I can bet there are going to be many maintenance issues when I walk through the door. Once inside, all home inspectors are trained to look for recent repairs, fresh or non-matching paint, and do-it-yourself projects. All of these are signs that I need to spend a little more time and look a little more closely to ensure that the seller isn’t trying to hide previous damage.